Terre de Lumiere is like a “luminous gourmand”. It opens with bright bergamot that ventures slightly into Earl Grey tea territory. I also pick up something that is like dried apricots. There’s an interesting mix of aromatic lavender and syrupy white florals. The florals in this are discreet and dipped in honey. It starts to wear like a black tea with dried lavender buds and a spoonful of honey. The scent is warm and sweet but not too sweet. I think its radiance and the addition of an aromatic lavender keep it from being overly gourmand. The dry-down keeps with the theme of warmth. It’s like a balsamic vanilla-amber with a powdery almond and a lot of musk. I also pick up on something that is like patchouli, adding a woodsiness to the fragrance. What I like about Terre de Lumiere is that it’s light enough for summer wear, but it’s also a fragrance with depth that can be worn in cooler weather. I also like that is sweet but it’s balanced by aromatic notes. Overall, it’s a lovely perfume that fits perfectly with the “South of France” vibe of the entire L’Occitane brand. Give Terre de Lumiere a try if you like radiant, warm fragrances or are looking for a something honeyed. Or if you like perfumes like Guerlain Mon Guerlain/Guerlain Mon Exclusif, Burberry Brit, Sarah Jessica Parker Stash Unspoken, Roberto Cavalli Just Cavalli for Her and/or Armani Sensi for Her. 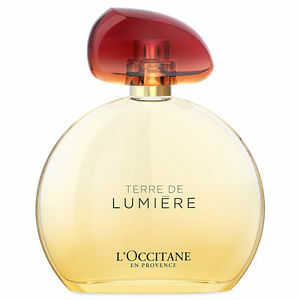 Terre de Lumiere comes in a few sizes with the 1.7 oz retailing for $79 at L’Occitane and on Amazon. Victoria’s Final EauPINION – Honey, lavender and sunshine. I haven’t tried many L’Occitane perfumes despite loving their bath/body line. But, every L’Occitane perfume that I’ve tried so far has been really enjoyable. They’re crowd-pleasers that aren’t dull. ¹I have a saying of “perfumers of three, leave them be” because so many of those perfumes suffer from “too many cooks in the kitchen” syndrome. But, this one was a pleasant surprise. *Product purchased by me. Product pic from the brand. Benedetta Barzini in Pucci circa 1968 pic by Henry Clarke from pleasurephoto.wordpress.com. She’s one of my favorite supermodels. Amazon is an affiliate link.